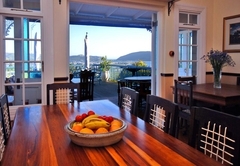 Guinea Fowl Lodge is one of the highly recommended Knysna guest houses and provides accommodation in 6 guest rooms for tourists visiting the Garden Route region. 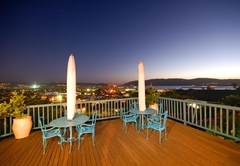 On the banks of an enormous estuary lies Knysna, a town of extreme beauty. Our beautiful indigenous forests alongside Knysna are home to the only free ranging elephants in the world. 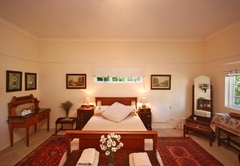 In this amazing setting you will find Guinea Fowl Lodge. 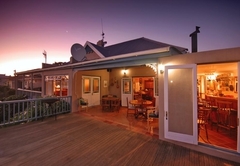 Guinea Fowl Lodge is perfectly situated - a mere five minute walk to town central and the Waterfront. 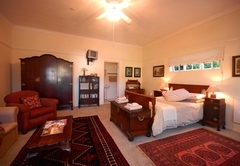 Guinea Fowl has six very comfortable rooms available. 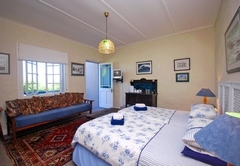 All rooms are individually decorated with old cottage antiques which give a warm home from home atmosphere. All rooms are en suite with showers only. Each room has its own private outside entrance. 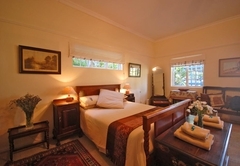 Is a twin room with private balcony and beautiful views of Heads and Lagoon. 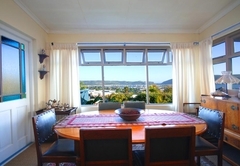 Is a double room with private balcony and beautiful views of the Heads and Lagoon. 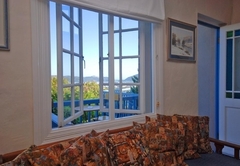 Is a twin room with private balcony and beautiful views of the Heads and Lagoon. 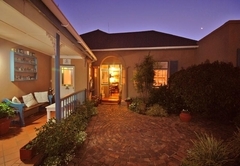 Is a very spacious family room with double bed and double sleeper couch with private verandah. 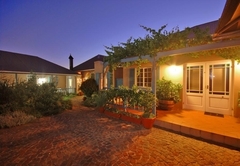 Is a spacious twin room with large shared garden patio. 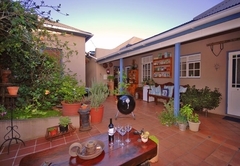 Is a double room with large shared garden patio. All rooms have coffee and tea making facilities. There is a safe in the main office where guests can leave their valuables. All rooms have hairdryers, fans and heaters. 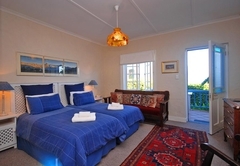 All rooms have TV’s, M-Net and DSTV. There is a laundry service available. We are off the busy main road so the noise is not a problem for a good nights sleep. In the morning it will be all about enjoying a host of activities in this great environment, starting with a great South African breakfast consisting of a selection of cereals, cheeses, fruit, yoghurt, and of course a hearty warm selection of eggs, bacon, sausages, mushrooms, tomatoes, toast, jams, tea or coffee. All served on the sunny deck or if weather not so good in the dining room of the old homestead. Your vehicle will be safe, as there is covered parking on the property behind remote controlled gates. Each room has a remote for gate so guests are able to come and go as they please. There is a salt water swimming pool available, towels are supplied. 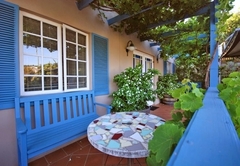 A braai (South African barbeque) is available at the pool (plates, knives and forks can be supplied by the guesthouse). 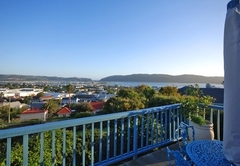 From there it is a choice to explore our natural beauty, or to enjoy hiking, canoeing, sailing, surfing, bowls, golf, whale watching or to just sit at the pool and drink up our South African sun. If that is not enough to whet your appetite there are many craft centres, museums, art galleries and township tours available. All these activities we will gladly assist in arranging for you if needed. In the evening there are many excellent restaurants within walking distance from Guinea Fowl Lodge or a cocktail cruise on the Lagoon is a great way to end the day. The owner, Mart, is motherly in her care for the wellbeing of guests, tracked me throughout my drive from Mossel Baai to ensure I arrived safely. 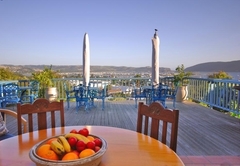 We really enjoyed our stay in Knysna and the Guinea Fowl Lodge. We had a very warm welcome and the hosts were very helpful. The views were fabulous and the breakfasts excellent. 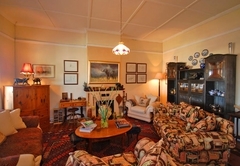 The rooms could be updated but we if we return to Knysna in the future we would return to Guinea Fowl Lodge.